Stream Analytics can target Azure Cosmos DB for JSON output, enabling data archiving and low-latency queries on unstructured JSON data. This document covers some best practices for implementing this configuration. For those who are unfamiliar with Cosmos DB, take a look at Azure Cosmos DB’s learning path to get started. At this time, Azure Stream Analytics only supports connection to Azure Cosmos DB using SQL API. Other Azure Cosmos DB APIs are not yet supported. If you point Azure Stream Analytics to the Azure Cosmos DB accounts created with other APIs, the data might not be properly stored. The Azure Cosmos DB output in Stream Analytics enables writing your stream processing results as JSON output into your Cosmos DB collection(s). Stream Analytics doesn't create collections in your database, instead requiring you to create them upfront. This is so that the billing costs of Cosmos DB collections are controlled by you, and so that you can tune the performance, consistency, and capacity of your collections directly using the Cosmos DB APIs. You must add 0.0.0.0 to the list of allowed IPs from your Azure Cosmos DB firewall. 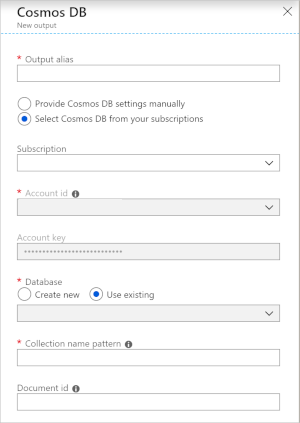 Some of the Cosmos DB collection options are detailed below. To match your application requirements, Azure Cosmos DB allows you to fine-tune the database and collections and make trade-offs between consistency, availability, and latency. Depending on what levels of read consistency your scenario needs against read and write latency, you can choose a consistency level on your database account. Also by default, Azure Cosmos DB enables synchronous indexing on each CRUD operation to your collection. This is another useful option to control the write/read performance in Azure Cosmos DB. For more information, review the change your database and query consistency levels article. Stream Analytics integration with Azure Cosmos DB allows you to insert or update records in your collection based on a given Document ID column. This is also referred to as an Upsert. Stream Analytics uses an optimistic upsert approach, where updates are only done when insert fails with a Document ID conflict. With Compatibility Level 1.0, this update is performed as a PATCH, so it enables partial updates to the document, that is, addition of new properties or replacing an existing property is performed incrementally. However, changes in the values of array properties in your JSON document result in the entire array getting overwritten, that is, the array isn't merged. With 1.2, upsert behavior is modified to insert or replace the document. This is described further in the Compatibility Level 1.2 section below. If you want to save all documents including the ones with a duplicate ID, rename the ID field in your query (with the AS keyword) and let Cosmos DB create the ID field or replace the ID with another column's value (using the AS keyword or by using the 'Document ID' setting). Azure Cosmos DB unlimited containers are the recommended approach for partitioning your data, as Azure Cosmos DB automatically scales partitions based on your workload. When writing to unlimited containers, Stream Analytics uses as many parallel writers as the previous query step or input partitioning scheme. At this time, Azure Stream Analytics only supports unlimited collections with partition keys at the top level. For example, /region is supported. Nested partition keys (e.g. /region/name) are not supported. 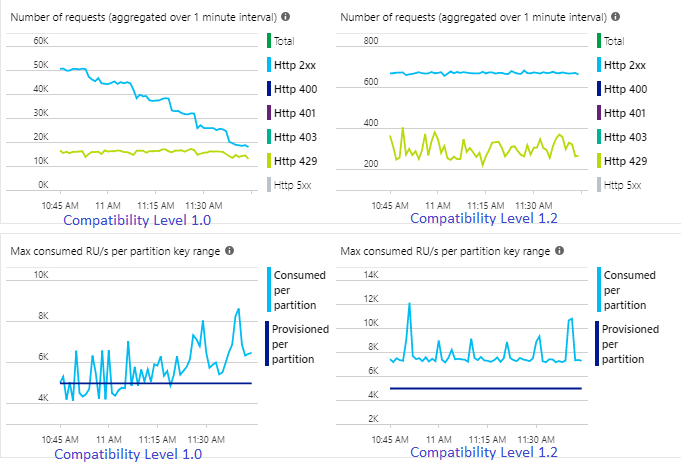 For fixed Azure Cosmos DB collections, Stream Analytics allows no way to scale up or out once they're full. They have an upper limit of 10 GB and 10,000 RU/s throughput. To migrate the data from a fixed container to an unlimited container (for example, one with at least 1,000 RU/s and a partition key), you need to use the data migration tool or the change feed library. Writing to multiple fixed containers is being deprecated and is not the recommended approach for scaling out your Stream Analytics job. The article Partitioning and scaling in Cosmos DB provides further details. With Compatibility level 1.2, Stream Analytics supports native integration to bulk write into Cosmos DB. This enables writing effectively to Cosmos DB with maximizing throughput and efficiently handle throttling requests. The improved writing mechanism is available under a new compatibility level due to an upsert behavior difference. Prior to 1.2, the upsert behavior is to insert or merge the document. With 1.2, upserts behavior is modified to insert or replace the document. Before 1.2, uses a custom stored procedure to bulk upsert documents per partition key into Cosmos DB, where a batch is written as a transaction. Even when a single record hits a transient error (throttling), the whole batch must be retried. This made scenarios with even reasonable throttling relatively slower. Following comparison shows how such jobs would behave with 1.2. Below setup shows two identical Stream Analytics jobs reading from same input (event hub). Both Stream Analytics jobs are fully partitioned with a passthrough query and writing to identical CosmosDB collections. 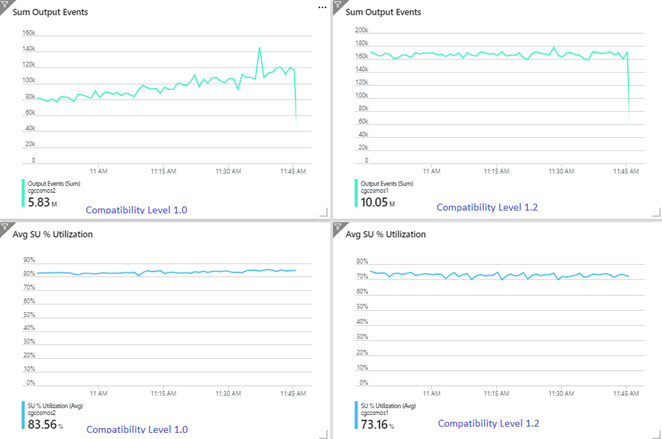 Metrics on the left is from the job configured with compatibility level 1.0 and the ones on the right is configured with 1.2. Cosmos DB collections partition key is a unique guid coming from the input event. Incoming event rate in Event Hub is 2x higher than Cosmos DB collections (20K RUs) are configured to intake, so throttling is expected in Cosmos DB. However, the job with 1.2, is consistently writing at a higher throughput (Output Events/minute) and with a lower average SU% utilization. In your environment, this difference will depend on few more factors such as choice of event format, input event/message size, partition keys, query etc. With 1.2, Stream Analytics is more intelligent in utilizing 100% of the available throughput in Cosmos DB with very few resubmissions from throttling/rate limiting. This provides a better experience for other workloads like queries running on the collection at the same time. In case you need to try out how ASA scales out with Cosmos DB as a sink for 1k to 10k messages/second, here is an azure samples project that lets you do that. Please note that Cosmos DB output throughput is identical with 1.0 and 1.1. Since 1.2 is currently not the default, you can set compatibility level for a Stream Analytics job by using portal or by using the create job REST API call. It’s strongly recommended to use Compatibility Level 1.2 in ASA with Cosmos DB. Creating Cosmos DB as an output in Stream Analytics generates a prompt for information as seen below. This section provides an explanation of the properties definition. Output alias An alias to refer this output in your ASA query. Subscription Choose the Azure subscription. Account ID The name or endpoint URI of the Azure Cosmos DB account. Account key The shared access key for the Azure Cosmos DB account. Database The Azure Cosmos DB database name. Collection name pattern The collection name for the collection to be used. MyCollection is a sample valid input - one collection named MyCollection must exist. Document ID Optional. The column name in output events used as the unique key on which insert or update operations must be based. If left empty, all events will be inserted, with no update option.